Milan isn't a big city - or at least the bit most people are interested in isn't terribly large. The Roman walls enclosed an area of about 215 acres (87 hectares), and most of the sights you are likely to visit would have been inside the Roman walls or immediately outside them. 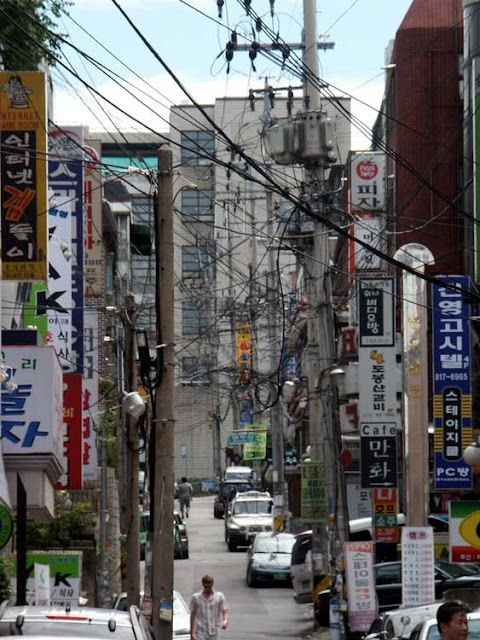 This means that most of the time you will be most concerned with getting to and from the middle of town, because once you're there, just about eveything is walkable. 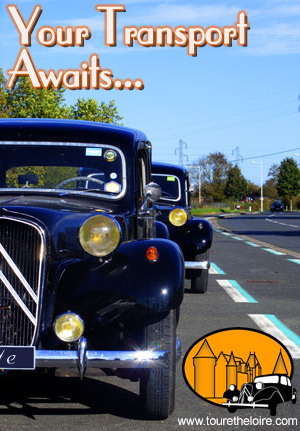 There is a wide range of transport available: trams, trains, metro, buses, trolleybuses, bike and car hire. 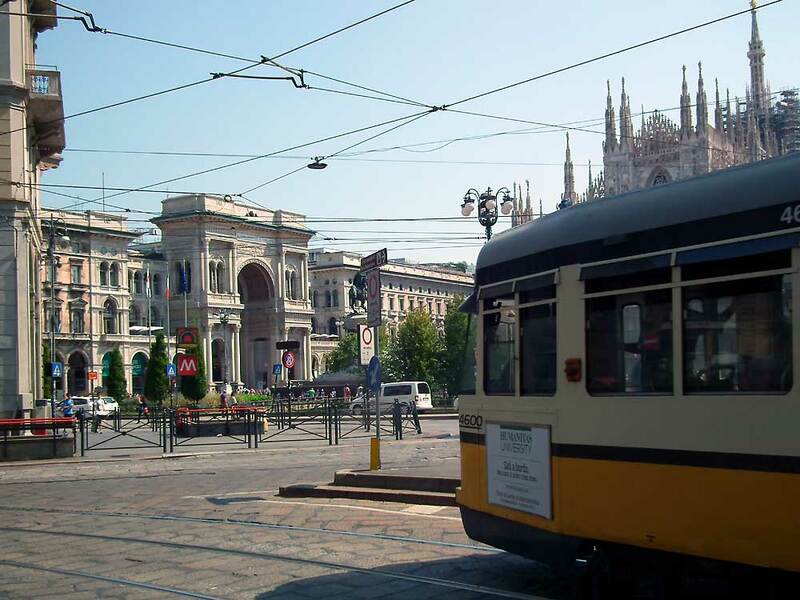 We used the trams, mainly because two lines ran right past the front of our apartment: one to the middle of town, and the other to the Castello Sforzesco (Sforza Castle), the main metropolitan museum. The other reason we used the trams is that although they are slower than metro travel, you can actually see something of the area you are travelling through. And we like trams. (We also like trolleybuses, but they never seemed to be travelling somewhere we wanted to go, being run mainly on the city ring road). 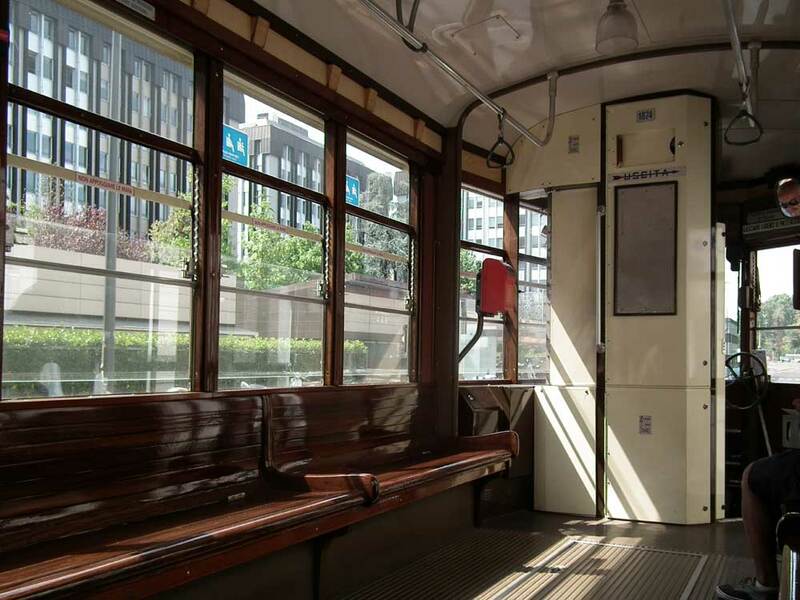 You may have noticed that some of the trams look old. These aren't museum pieces trotted out for a special day, but Type 1928 trams (named for the year they were introduced) in regular service on half a dozen lines. 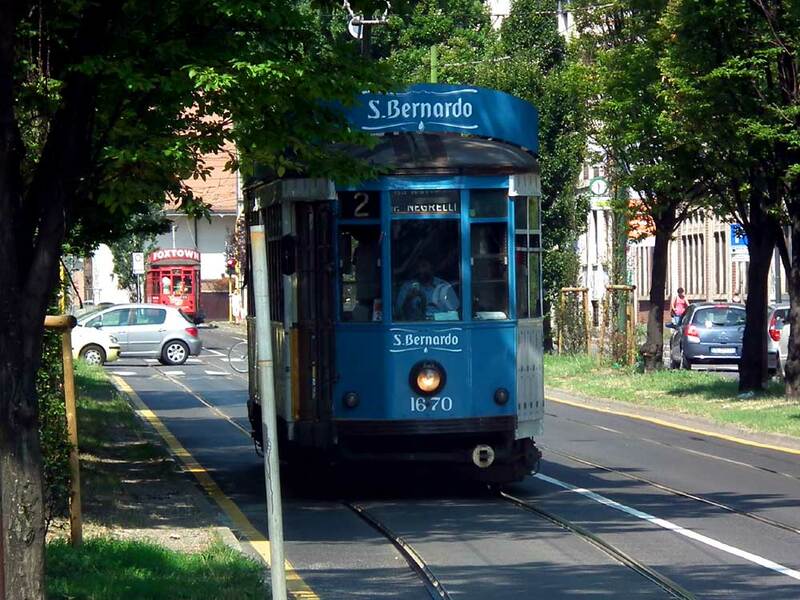 Line 2 (the tramline from our apartment to the Sforza Castle) is run entirely with these old trams. Not fast or especially comfortable, but full of character. Using the public transport is simple - buy a ticket at a tobacconnist or a ticket machine, which gives you 90 minutes on the bus/tram network, or 1 ride on a train. All at 1€50 per ticket, or 13€80 for 10 rides (they call it a carnet, but it's just one ticket you repeatedly stamp). There is also a 1 day pass for 4€50, ideal for those days when you're buzzing backwards and forwards doing organising stuff. To ride a tram or bus, stamp your ticket in the machine when you board the first vehicle, and as long as you get on the last vehicle of your trip before the expiration of 90 minutes, you don't need to stamp it again. For the metro, you use the ticket in a turnstile to access the platform. We were particularly taken by how comprehensive the transport system is - and how inexpensive. The longest we had to wait for a metro was 4 minutes, and a tram 6 minutes. Truly excellent. Yup - it's that confused. This screenshot was taken yesterday lunchtime. Somewhere down in all those trees is a large river. 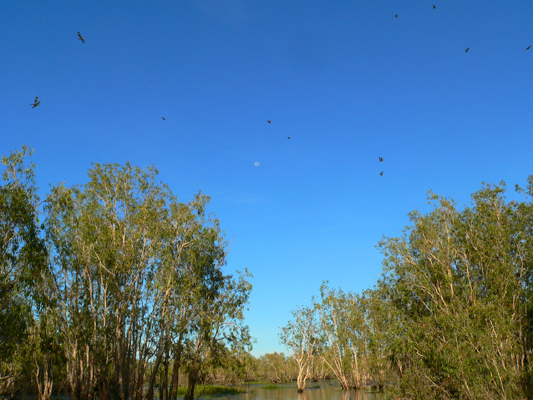 Three weeks before this photo was taken the river flooded and rose 19 metres, causing a state of emergency to be declared by the Northern Territory government. The river and the spectacular gorge it has created form an important tourist attraction in this isolated area. The Northern Territory Tourist Office bill it, with considerable justification, as 'where the outback meets the tropics'. Aboriginal culture and heritage, outdoor activities, especially kayaking, and wildlife watching feature heavily on the agenda if you visit this area. A la cuisine hier: I had a litre and a half of aging raw milk kicking about so I decided I needed to make some sauces. First I made custard, which promptly curdled (grrr!) then I used the rest for a blue cheese sauce. The blue cheese in question was a Stilton with a best before date of 1 June. It was perfectly fine in sauce. Also on the list of things that needed using was half a punnet of tiny teardrop shaped tomatoes from one of our local producers. I decided to tweak Jean's recipe for stuffed zucchini, and made smoked salmon and blue cheese stuffed zucchini. The zukes turned out well, even Simon voted them OK (although he was careful not to sound too encouraging in case I am tempted to make stuffed zucchini again...). If I do make something like this again I will use tuna. Smoked salmon is wasted in this with the blue cheese. Also taking up a great deal of space in the pantry are trays of apples. You'd never know I'd picked any if you look at the trees in the orchard, but I have hundreds of apples in the pantry. So yesterday I made two big spiced apple and rhubarb crumbles and boiled up a ten litre pot of apples for jelly. They are currently sitting in the jelly bag to extract the liquid. Mary Stuart, or Mary Queen of Scots as she is more widely known, was born in Scotland in December 1542. Her father was James V of Scotland and her mother Marie de Guise, a member of a powerful French Catholic family. Within six days of her birth she was Queen of Scotland and her father dead. A child on the throne is always a recipe for unrest, and in addition, civil war was brewing in Scotland just like it was in France, in the guise of the Reformation. Henri II was on the throne in France and just about keeping a lid on it. Henri suggested a betrothal between his infant heir and Mary, so when Mary was five years old her mother sent her to live with the French royal family. 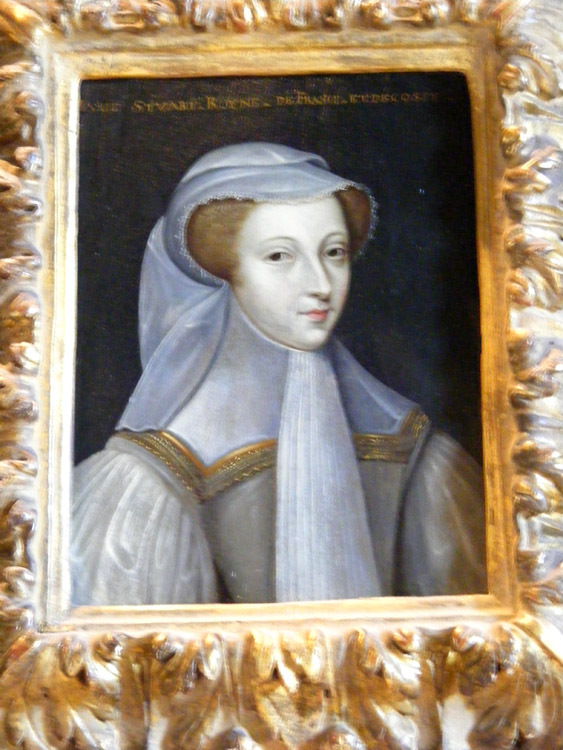 Marie de Guise felt the situation in Scotland was just too dangerous for little Mary to stay, but Marie herself stayed behind and ruled in Mary's sted as regent. Portrait medallion of François II and Mary, on display at the Chateau of Chenonceau. On arrival in France Mary formed immediate friendships with the two oldest of Henri II and Catherine de Medici's children, the Princesse Elisabeth, later to become Queen of Spain, and the Dauphin François, her betrothed. Like the French royal children, Mary's education was put into the capable hands of the King's mistress, Diane de Poitiers and Mary became close to her too. The Chateau of Amboise served as the children's principal residence. Mary grew into a lively and intelligent young woman. Her looks were striking as she was red-haired, pale skinned and extraordinarily tall. At 180cm (5'11") she towered over most people at court, including her husband to be, who was rather short. 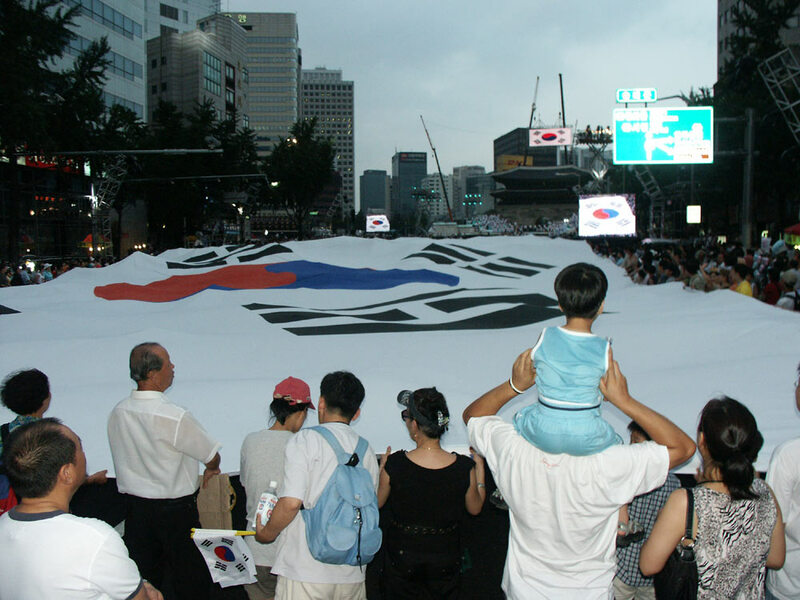 Average height for men at this time was 168cm (5'6") and average height for women 157cm (5'2"). 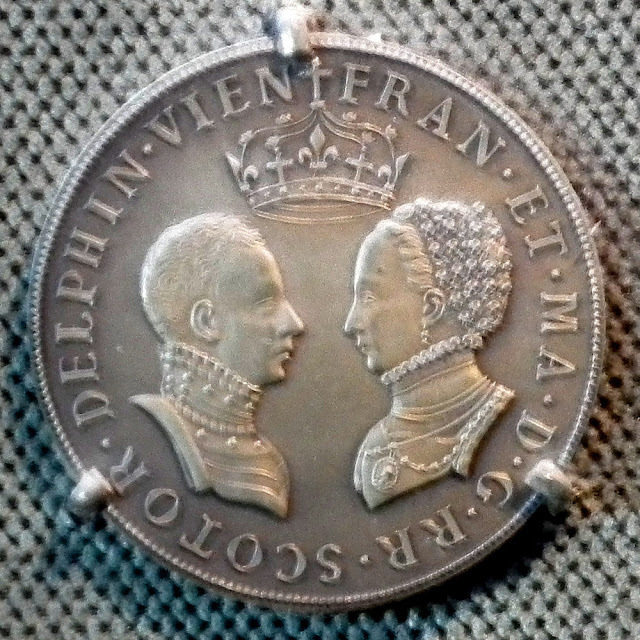 She and François were married in May 1558. Secretly, Mary had signed an agreement that would have France control Scotland should she die childless. Later that year her second cousin, the Protestant Queen Elizabeth I ascended the throne of England. For Catholics, she was illegitimate, and Mary, the granddaughter of Henry VIII's sister, was the legitimate heir to the English throne. The plots were thickening. In July 1559 Henri II was killed in a jousting accident and François and Mary found themselves the teenaged king and queen of France. Her powerful uncles stepped in to control the tangled web of intrigue that was being woven all around Mary. The Protestants increased their political agitating in both Scotland and France during 1559-60, culminating in France in what is known as the Tumult of Amboise. Huguenots planned to kidnap young François and arrest the Guises. Word of the plot reached the ears of the Guise brothers and they hastily moved the young king and queen from the Chateau of Blois to the Chateau of Amboise as it was easier to defend. The conspirators stormed the chateau but were defeated and well over a thousand Protestants executed and their bodies hung from the Chateau. It caused such a stench that the court decamped and Amboise never regained the status it had previously enjoyed. 17th century copy of a François Clouet portrait of Mary in mourning, hanging in the Chateau of Blois. 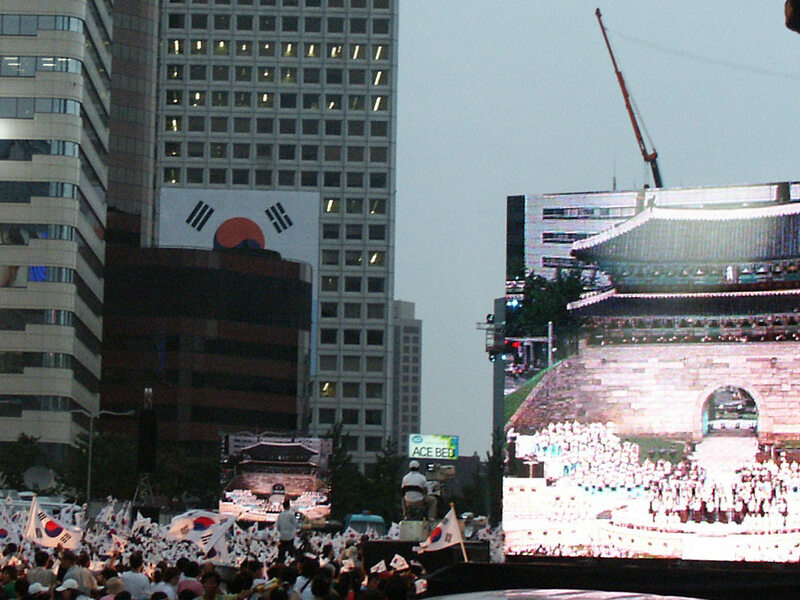 She wears white as it was the royal colour of mourning. 1560 was a year of unmitigated misery and trouble for Mary. After the Amboise conspiracy in March her mother died in June, then her husband in December. Left a childless widow at 17, with her mother-in-law, Catherine de Medici making it plain that she was no longer welcome in France, due to her close relationship with Diane de Poitiers, and Scotland at grave risk of being overrun by its southern neighbour England, Mary made the inevitable and fateful decision to return to her country of birth in 1561. Well out of her depth politically now, and without the close presence of her uncles for protection and advice, nothing went right for her from this point onwards. Although German born the surrealist artist Max Ernst lived most of his adult life in France. 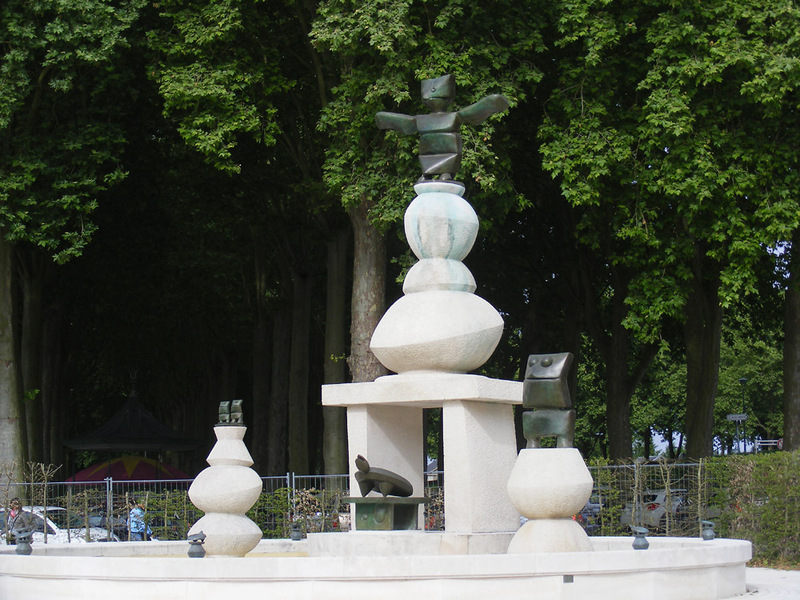 He produced the fountain on the Mail in Amboise in 1967. 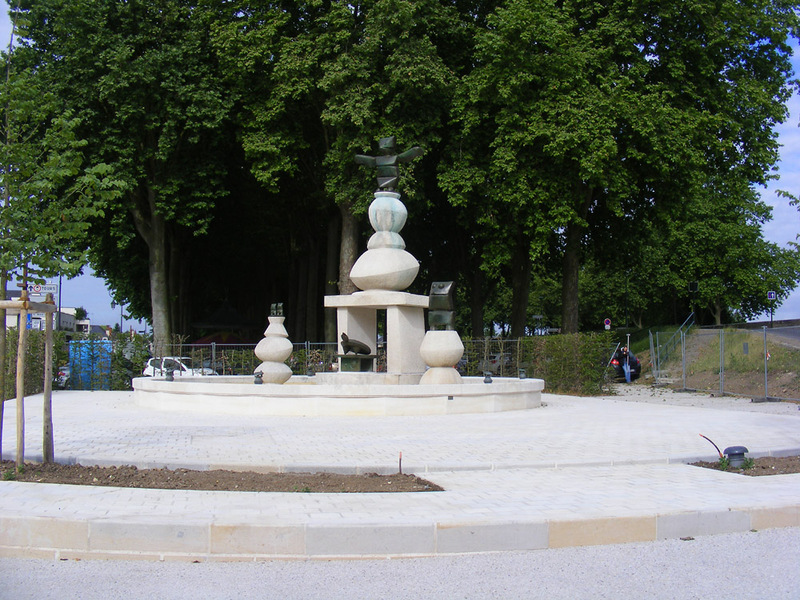 The creature on the top is known as the genie and is looking in the direction of Clos Lucé, the home of Leonardo da Vinci. The sculpture was restored in 2014, a process that took longer than expected. When I photographed it in June 2015 the local authority was still engaged in landscaping and restoring the surroundings. Whilst the fountain was away an exhibition about Ernst was set up in a nearby church. A la cuisine hier: Ten jars of apple jelly, from windfalls after the big storm a couple of days ago. Also a batch of stewed apples and blackberries. Trappists and Trappistines are monks and nuns of the Cistercian Order who follow the strict rule of Saint Benedict. Trappists are famous for restricting their speech to that which is strictly necessary (although not a vow of silence as many believe) and the wonderful artisanal products such as beer, liqueurs and cheese that they make. 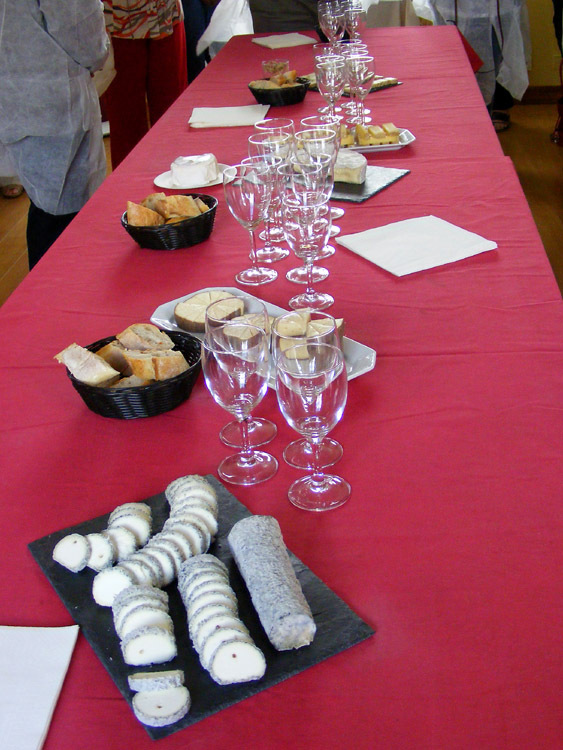 A selection of cheeses set out for a tasting session at Les Fromages du Moulin. 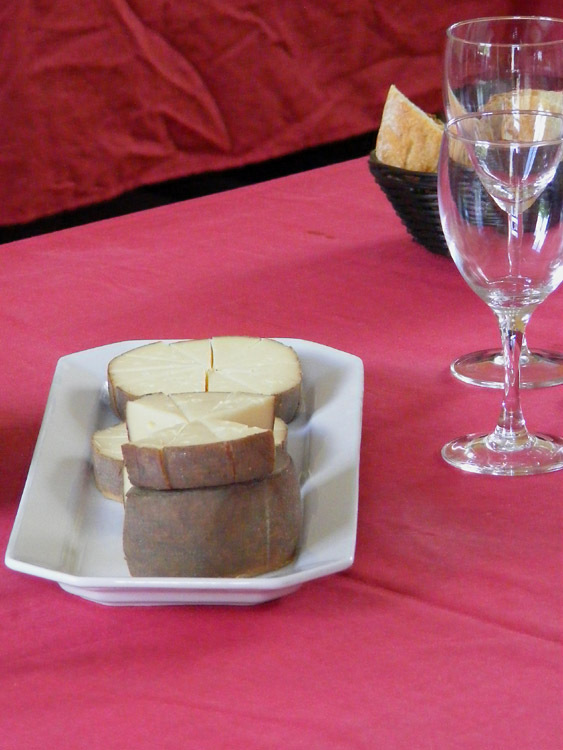 Timanoix and Trappe Echourgnac are two unusual cheeses made by two Trappist monastic institutions, one monks in Morbihan (southern Brittany), the other nuns in the Périgord area of the Dordogne. The name Timanoix is derived from the name of the Abbey in Brittany, Timadeuc, and noix, the French word for walnut. Echourgnac is the name of the Abbey in the Dordogne. The rind is washed and brown and the cheese has a distinct walnut aroma. It's a cow's milk cheese, quite soft and pale. The reason for the walnut aroma is that the solution used to wash the rind is a mixture of brine and a walnut liqueur from a Périgord distiller. There is no sensation of residual alcohol, it's more like the cheese has been wrapped in walnut leaves or rubbed with green walnuts. After aging for a couple of months the cheese is a perfect blend of walnut and mild creamy smooth dairy flavours. Rodolphe talking about some Comté. Timanoix is a 21st century cheese, created when the sisters of Echourgnac could no longer meet the demand for their walnut flavoured cheese. They offered their brother monks the opportunity to make the cheese and satisfy what was a growing niche market. 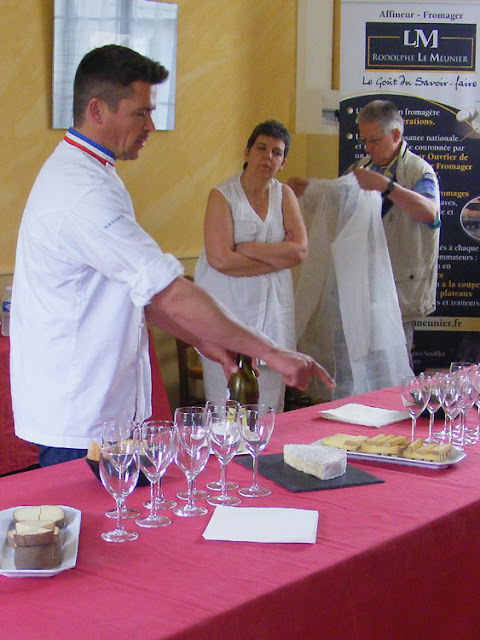 Both religious houses use the cheese as a means of supporting their local dairy farmers, by buying their milk and working with them to improve the quality of the raw material and the value added product. I'd never heard of either cheese, but earlier this year cheese refiner Rodolphe le Meunier offered a Timanoix as part of a tasting session I had arranged for some clients. It's a cheese I will look out for and buy if I see it again. This floral arrangement was spotted in the church in Azay le Rideau back in June. The choice of flowers and vegetation interested me. The flowers are all tall spikes -- acanthus, delphinium and lizard orchids. The greenery is male fern, bay laurel and variegated ivy. The lizard orchids must have been picked from the wild, and possibly the fern too. I'm not sure how I feel about this. Quite likely they were growing in the flower arranger's garden as wild volunteers. My instinct is to discourage the picking of wild flowers but many French people see nothing wrong with it. 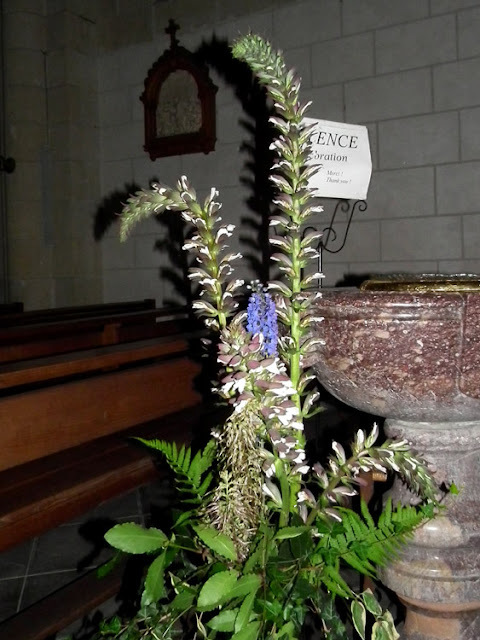 I am intrigued that lizard orchids have been chosen for the church, as many French people do not like them and their stinky perfume. Both the lizard orchids and the male fern are reasonably abundant in this area. What worries me about picking them is the example it sets. 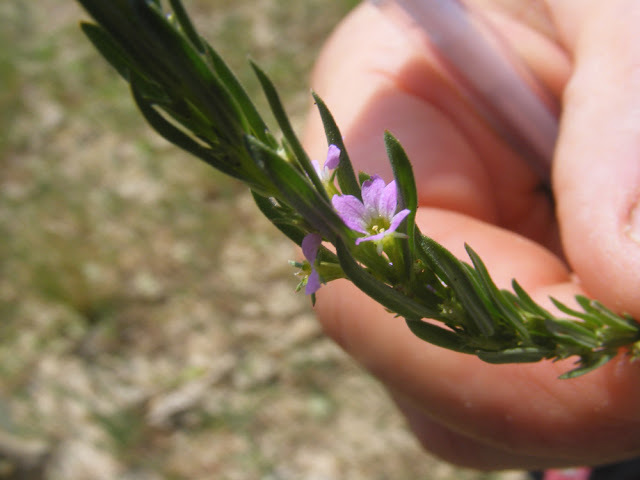 Many people can't tell a rare plant from a common one and have no idea that the rule of thumb for wild picking is to only take 10% of what you see, if you must pick. Far too often I have encountered patches of flowers that have been stripped of every single flower stalk, probably by a single unthinking picker who wants them for the table and doesn't realise that half of them will wilt instantly in water and that other people might appreciate seeing the flowers in the wild. Once picked they have no chance to set seed and reproduce. A while ago I received an invitation to accompany the botanist François Botté to survey an area of land under reclamation after work on the high speed train line (Ligne Grande Vitesse or LGV) from Tours to Bordeaux had been done. So on 5 July I took myself off to Sepmes to be at the church there at the appointed time. - a plant I had never heard of, much less seen before. When François turned up he greeted me and another bloke who was lurking about. François and I know each other well enough to cheek kiss (faire la bise) on meeting but the stranger and I shook hands when it was clear he was joining us. He neither introduced himself, nor did François tell me who he was (this is a not uncommon occurance in France). I never caught the other man's name, but that's not a problem because addressing someone as Monsieur is fine. Hairy Buttercup Ranunculus sardous, an unusual species related to the more ubiquitous buttercups that everyone here has in their lawn. I was wearing sandals and François looked at my feet and asked if I had any boots. No? Oh well, I would have to wear his spare pair, which he fortunately had in the back of the car. I pointed out that he hadn't mentioned before that I would need rubber boots, so I hadn't thought to bring any. The boots were size 42 (I'm size 39) so they weren't too inconveniently large. Then he directed me to sit in the front of his car and the other bloke to sit in the back, on a quite substantial pile of hay. He explained that it wasn't for rabbits, it was because he was collecting specimens of different grasses for a display board and his wife refused to allow him to dry them in the house, therefore they lived in the car. 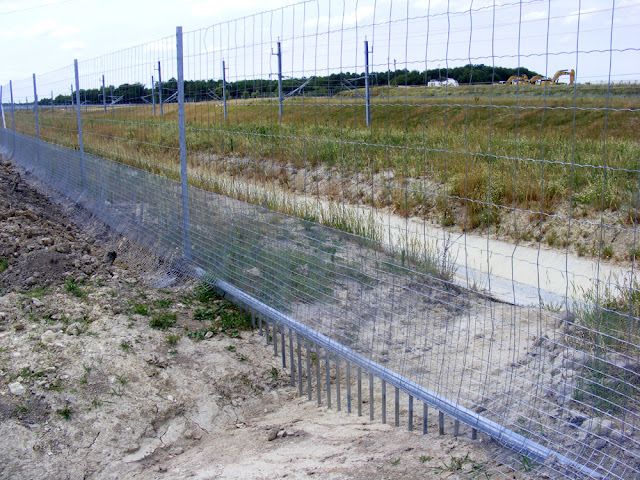 Looking into the path of the LGV through the barrier fence. The site we were to survey was just outside of town, behind a ramshackle farmhouse. The actual process of surveying was a matter of trying to keep up with François, who had the advantage of being a) already familiar with the site, and b) a fearsomely good botanist. Mystery Monsieur and I trailed behind frantically taking notes and photos and occasionally proudly pointing out something that we recognised or something François hadn't spotted. The land has been compulsorily purchased from the farmer because the path of the train line ploughed straight through a couple of small ponds which were the breeding grounds of some protected amphibians (frogs and newts). 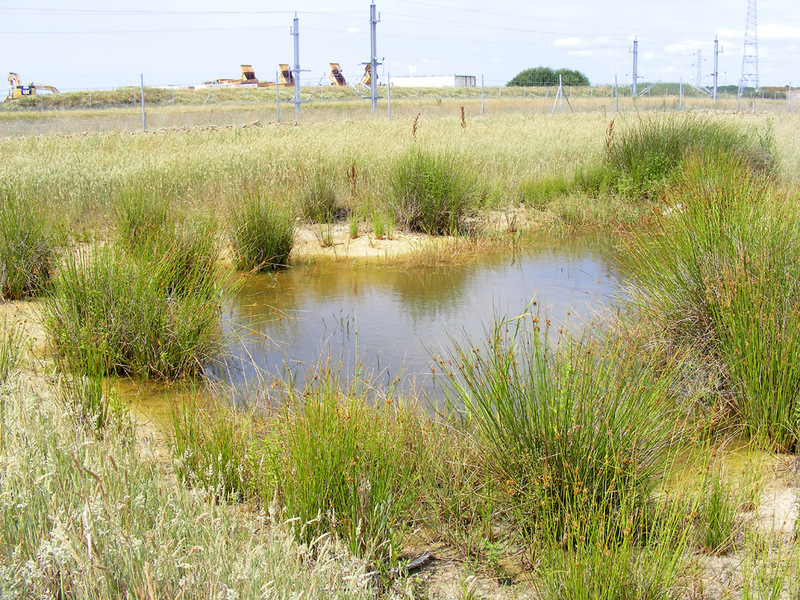 The ponds have been recreated and an area of grassland and a small wood act as a buffer zone and additional habitat for different stages of the amphibians' life cycle. The Conservatoire du Patrimoine Naturel has been engaged to monitor the site for the next 50 years and so our survey of plants and dragonfly species was part of their regular monitoring of the site. François is also in charge of maintaining the site so that the grassy areas do not scrub over with sallow. He is going to organise the farmer to periodically slash the sallow, which will just be left on site. He says it's important to use a technique that doesn't turn the sallow into chips. He doesn't want mulch, he wants brash. François surveying one of the ponds. The recreated ponds are now 5 years old and doing very nicely. 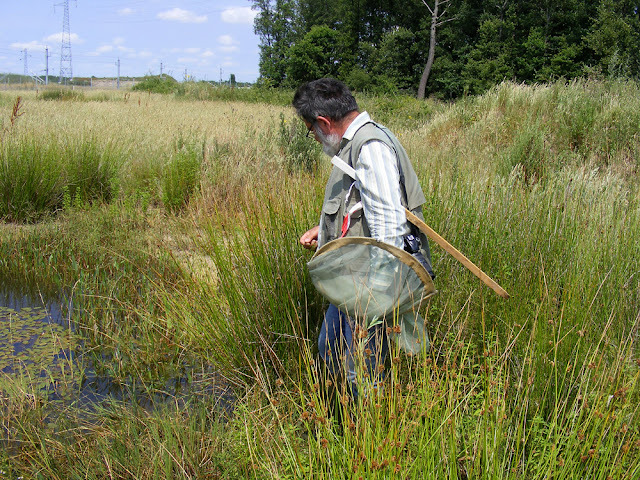 The level of vegetation is satisfactory, as is the colonisation by dragonfly and damselfly species. The frogs, including Tree Frog Hyla arborea, have relocated well. We didn't check for newts, but I assume the newt people are happy with their progress too. There seemed to be a remarkable number of noteworthy plants on the site, as well as many more common chalk specialists that I have come to know and love. One of the recreated ponds with the train line in the background. 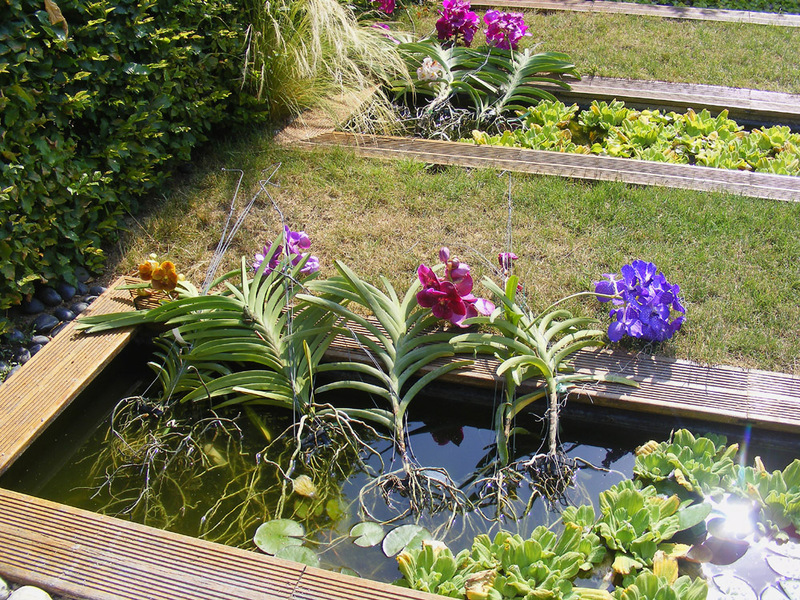 These little pools, which appear quite natural, are referred to by François as mares. I thought it would be a good opportunity to ask what the difference between a mare and an étang was. As I expected, François had the technicalities at his fingertips, and more. Mare: small and shallow (no deeper than a metre), with no exit. Can be natural or man-made. The English equivalent is pond or pool (includes rock pools). Etang: deeper, with a dyke and a drain or sluice at one end. Always man-made. The English equivalent is man-made pond (often a fishpond). Lac: a lake is a body of water which is deep enough that below 2m is a constant 12°C. The surface water is warmer than the deep water in the summer and colder in the winter. Mardelle: a pond formed by the action of the expansion and contraction of ice, sometimes by the dissolution of a limestone layer, sometimes by ice being blown across the limestone layer, always on an impervious clay base layer. Doline or aven: formed in karst limestone, a sinkhole. These can be of any diameter or depth from less than a metre to many metres. Marigot: a stagnant or even saline pond such as oxbow lakes, isolated pools in a partially dry river or a pool in a marsh, often filling and drying up seasonally. The Australian equivalent is a billabong. Weather News: It was a bit breezy here yesterday, with gusts presumably up to about 100 km/h. 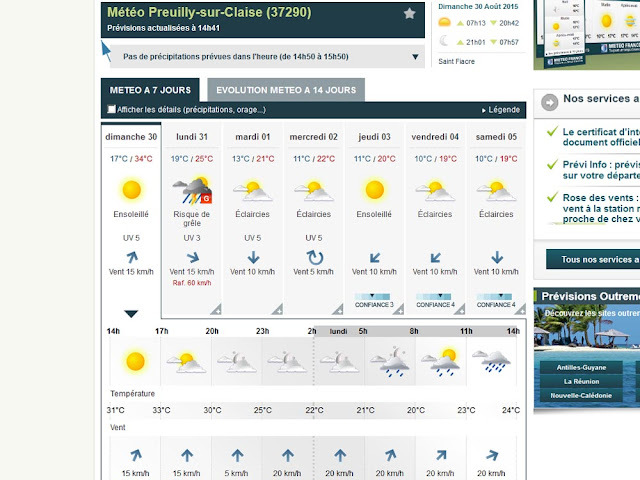 I say presumably because Preuilly sur Claise doesn't really have a weather station, so for things like wind we look at Chateauroux and Chatellerault, the nearest towns with weather stations, one to the east, the other to the west. Both places recorded record wins of 98 km/h yesterday afternoon. We didn't lose power, although we had one or two brownouts. According to La Nouvelle République 9000 foyers (best translated as establishments in this context) in Indre et Loire lost power, including a number of places in Loches. As in major cities all over the world, most of Milan's residents live in apartments. The old ones are in buildings constructed around a hidden central courtyard and the apartments' focus is inwards. More modern apartments have generous balconies which face outwards to the street. Some of the grander old blocks have both the traditional linked verandahs around the central courtyard and fancy balconies on the street side. 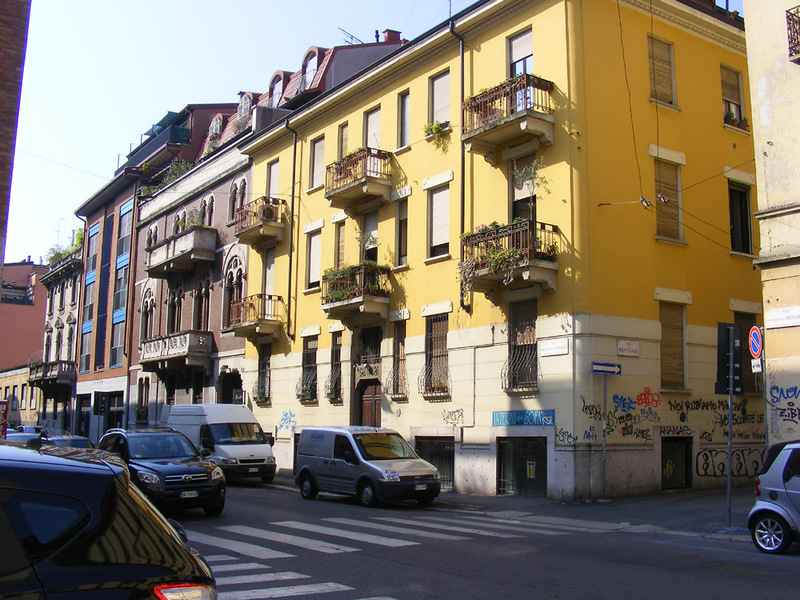 A typical residential street in Milan, with typical colours and architectural styles. Many buildings are a dark iron rich red brick, others are stuccoed and painted in lemon yellow or terracotta pink. The 'Vertical Forest', an award winning apartment complex, photographed from the tram. The Bosco Verticale, or 'Vertical Forest' is one of the the latest additions to Milan's housing stock. The complex is a pair of towers, with balconies planted with nearly a thousand trees, five thousand shrubs and over ten thousand other plants. The purpose of the planting is to combat pollution, regulate temperature and to provide sound insulation for the apartments. The occupants of the towers do not have to be gardeners. They pay a monthly fee to take care of all that. An older and rather grand apartment building. 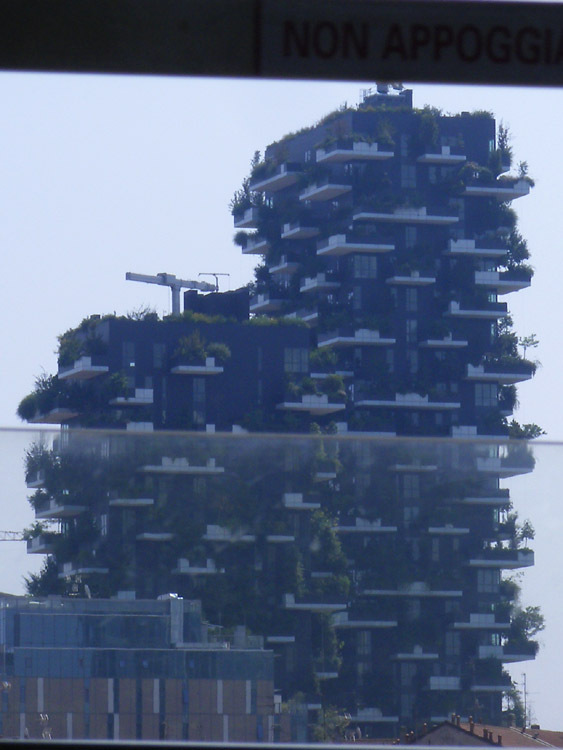 The Bosco Verticale is tapping in to an existing tradition in Milan. Virtually every balcony has a well cared for selection of greenery. Flowers are rarely used, nor are they are feature of public plantings in the streets. But the variety and exhuberance of foliage plants in the city is striking. 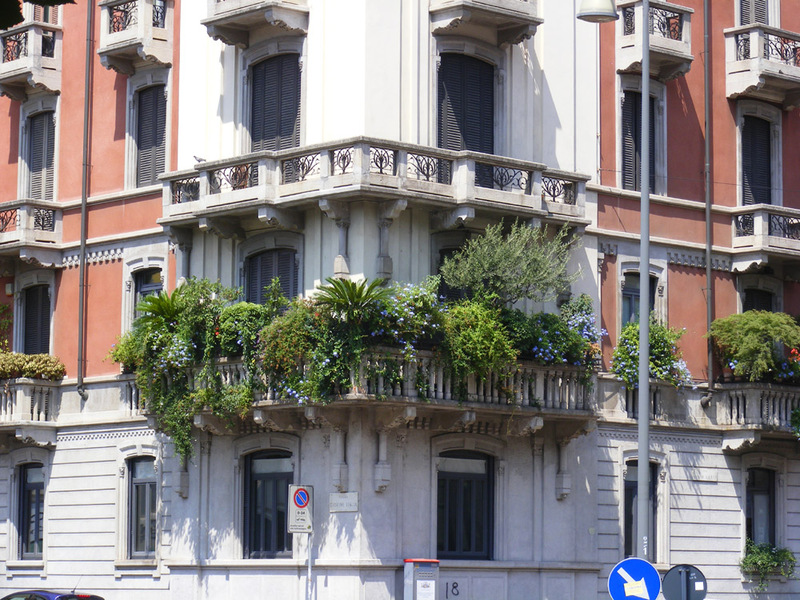 A contender for the lushest balcony in Milan I reckon. 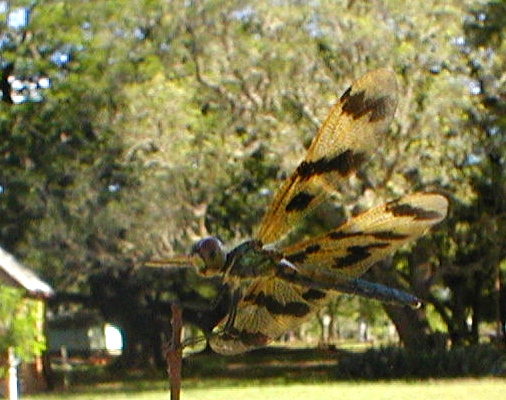 The Graphic Flutter Rhyothemis graphiptera (aka Banded Flutterer) dragonfly is found in the north of Australia, often in large numbers near still or almost still waters. The one above, the best photo I could manage of an uncooperative subject with my small camera at the time, was taken at Springvale Homestead. The black winged creatures in these two photos are not birds. 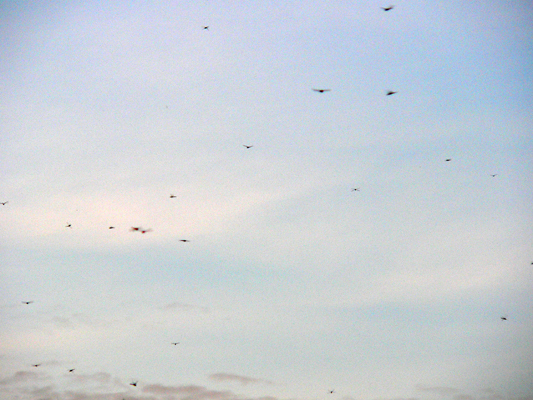 They are swarming Graphic Flutterers in the early morning over Home Lagoon in Kakadu National Park. This venerable lady flew over Preuilly sur Claise at lunchtime on Monday. She wasn't all that high up, but I didn't have a chance to set up the camera: I just picked it up and blasted off a shot before the plane meandered off out of sight. As you can tell by the fact the propeller doesn't appear to be spinning, I had apparently been photographing something in extremely bright light last time I used the camera (high shutter speed). It also appears from the extra grain that the camera is set on quite a high ISO for low light. With that kind of confusion in my head, I am kind of surprised that I even managed to get the plane in the frame. Yes, I know it's kind of sad that I was inside the house and still recognised an unusual aircraft engine note, but I think it has to do with having good (and quite musical) ears. 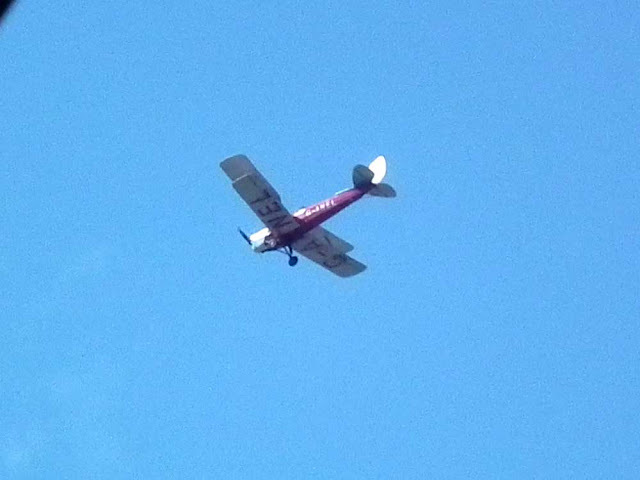 I even managed to identify the type of plane before taking the photo. I'm a boy. Boys can do that sort of thing. On Saturday a much better photo was taken of this plane at Woburn Abbey, in England. Not bad going for a machine made in 1939 as an Air Force training aircraft. If anyone has any 1975 or before deckchairs or camping chairs, camping table or beach umbrella, that they are willing to lend us or sell for a small price, drop us a line? We're wanting to accessorise for retro picnicking. If you have a tent from 1965 I am even more interested! .. that my teaching stint in Korea came to an end. I had really enjoyed myself, although working 6 days a week from 08.30 to 16.00 was harder than I was prepared for when I arrived. This was supposed to be a fun summer school holiday activity for primary school kids! the school I was teaching at. In the times I wasn't working (or preparing lessons, which apparently isn't considered work, as any teacher will tell you...) I had a bit of a social life, mainly revolving around BBQs, bars, and the odd bit of sightseeing. 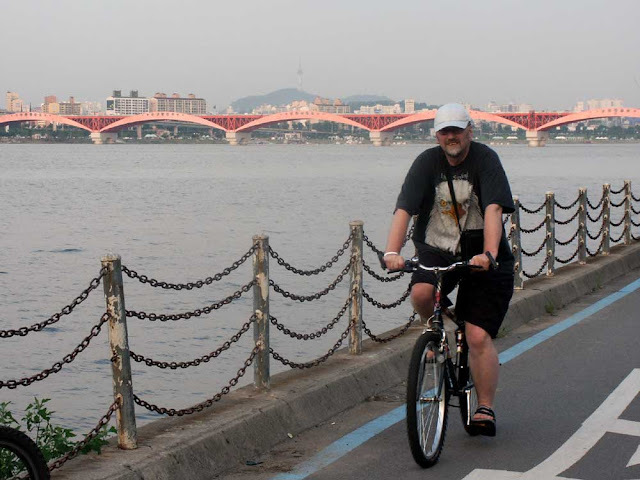 Although we teachers were living on campus, there was a riverside swimming pool a short taxi ride away, a network of bike paths, and a highly efficient subway system for trips into the centre of town. Man does exercise after work. Or - man does exercise before beer. Take your pick. 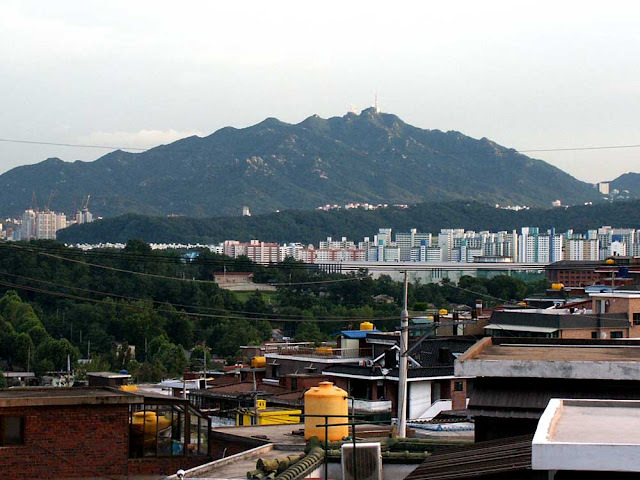 I really enjoyed Seoul - after a couple of weeks it rained overnight and washed the smog away and I was amazed at the views the next morning - I hadn't realised I had been two weeks in a city so close to proper looking mountains. 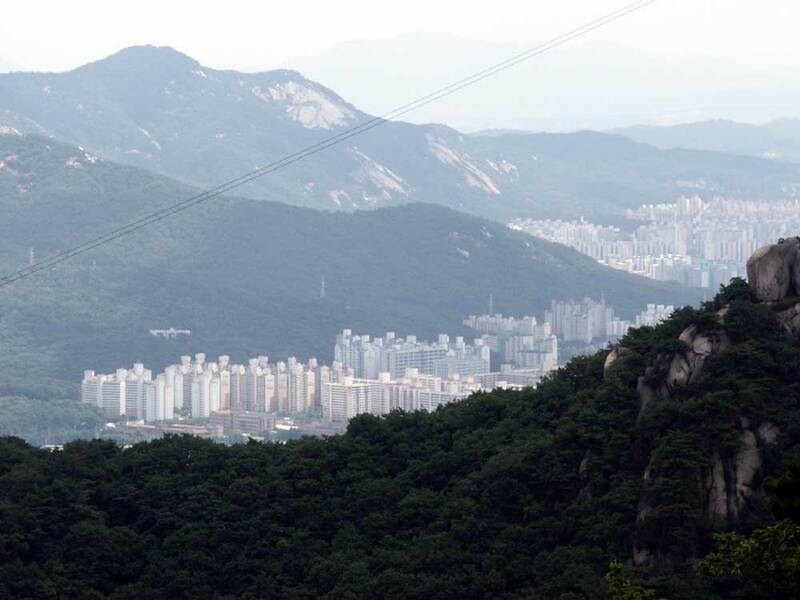 One Sunday I went on a walk through the mountains with the Royal Asiatic Society, and another weekend I visited Jamsil Sports Complex, the site of the 1998 1988 Olympics, with some of the other teachers. 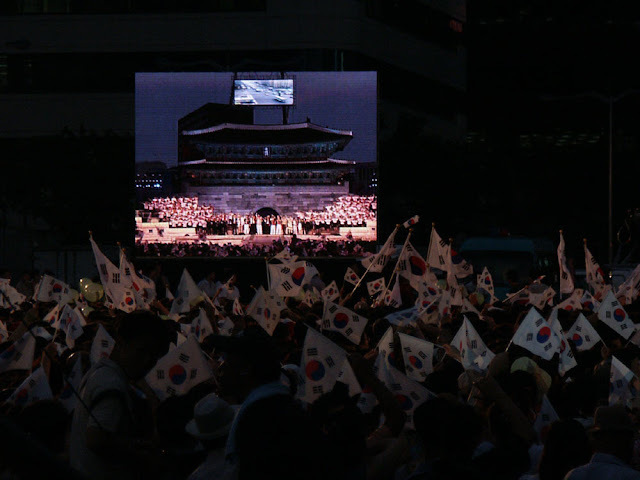 I really enjoyed myself, even if much of the time I was too hot and slightly confused. I was impressed by the literacy of your average Korean, made evident by just how huge (and full of people) the many books shops were. The foreign language section of one bookshop was enormous, and the books ridiculously inexpensive: it was in Seoul I bought my copy of Herodotus' "The Histories" (in English) for the equivalent of £2. What a civilised country. Or more to the point probably, dryer than the Tropics. 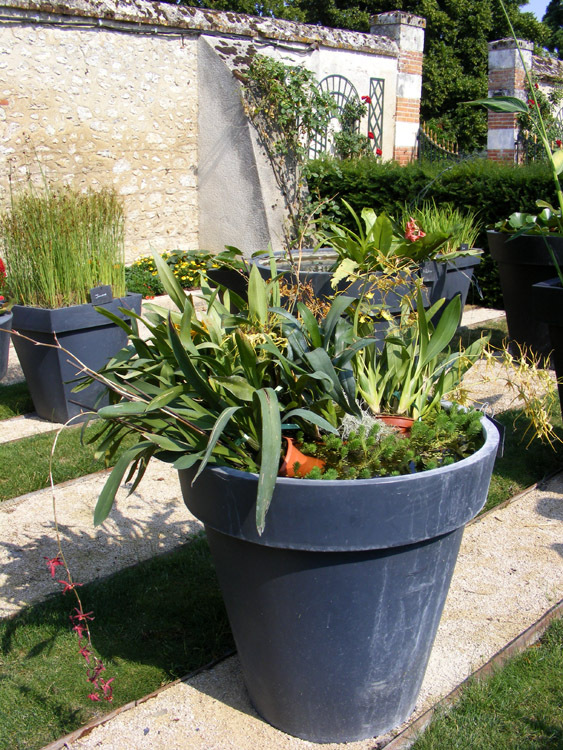 During the recent heatwave the gardeners at the Chateau of Cheverny took to dunking their collection of tropical epiphytic orchids in various parts of the water garden. Normally the orchids are brought out for the summer and live in a shade house equipped with a mister that goes on automatically every 10 minutes or so. Presumably the exceptionally high temperatures were drying the orchids out even with this system. Last Thursday was one of those stressful days that shouldn't really be. Like her younger sister, Célestine was due for a contrôle technique this year. In May Claudette passed her CT with aplomb because she had just been serviced and we had done a pre-CT check. Célestine's appointment was made last minute, immediately after we returned from Italy, and it was only a few minutes before we left home that I realised I hadn't checked her over. It was raining, not very warm, and so I had been tardy about getting out of the house. Add to that a session of car shuffling (Celestine was in the garage, Claudette parked behind her in the driveway) and time was short. Needless to say, one of the stop lights had blown. No problem, as I have spares. Or rather, thought I had spares, but had obviously used them all up. So - a bulb was scavenged from Claudette, hastily fitted (yeah, I know - I cracked the plastic lamp cover in the process) and we trotted off to Chatellerault - not our usual CT man, but it's August and everyone else was either full or on holiday, and logistics meant it had to be done last week. Anyway - we passed, and so are right for another two years. 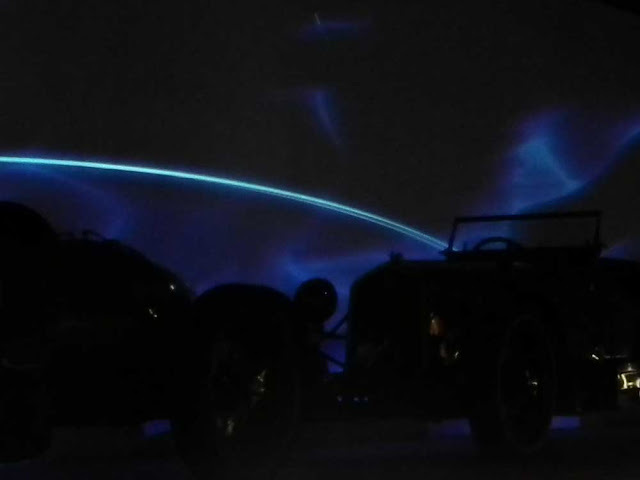 I even remembered to order some new bulbs from our regular supplier, which arrived yesterday. I hate roadworthy time, and have always hated it. I suppose it comes from my first cars in Australia which I bought cheap and which could not be relied upon to pass any sort of test. 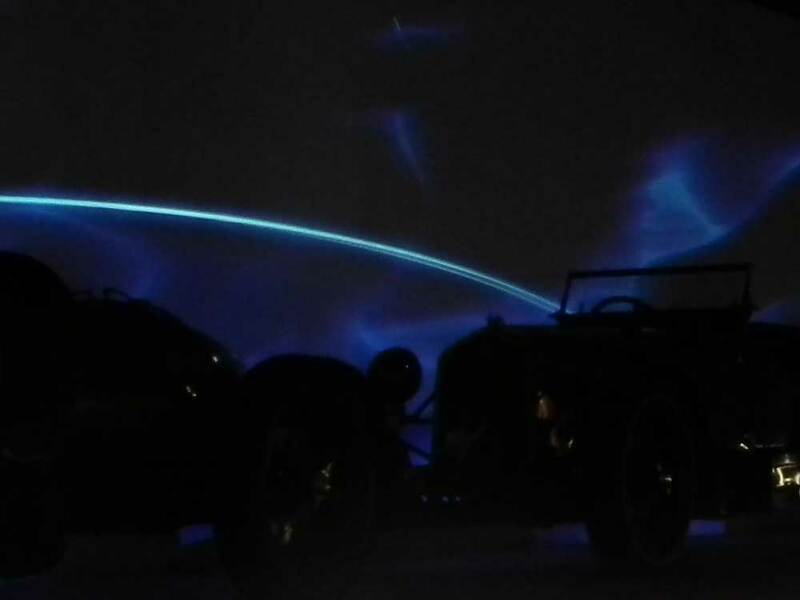 More recently it stems from having old cars with personalities and foibles. Swimming pools have rules. Of course they do. Most people know that in France men must wear briefs, and are not allowed to wear shorts in the pool. This is for 'reasons of hygiene' (I suspect for the same reason outback motels in Australia have a notice saying you are not allowed to swim in your clothes -- too many instances of sweaty truckies stepping out of their truck and into the swimming pool and clogging the filters up with dust and other debris that can be avoided if you just change into a swimming costume first). But this sign (pictured) caused me first to discuss with Ingrid what she thought it meant, then to look it up. APNEE is in capital letters so I wondered if it was an acronym (the French love an acronym). 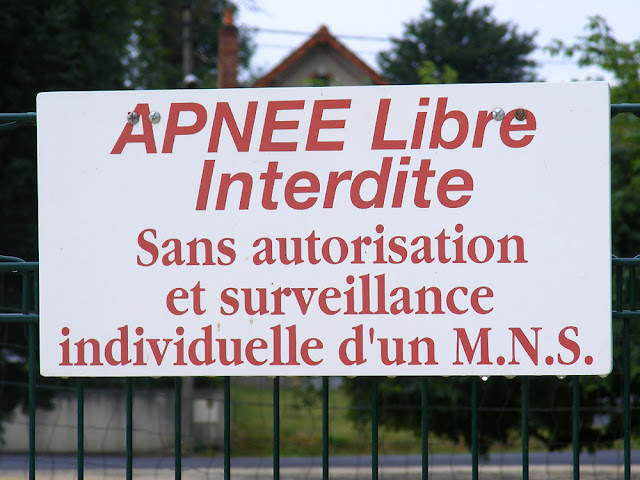 We both wondered if it was connected to apnea, perhaps one of those words that in English is rather formal, but in French is a perfectly ordinary word. This turned out to be closer to the mark. I consulted a couple of French online swimming forums. It was then clear that the sign meant: 'Holding your breath underwater is forbidden without authorisation and individual supervision of a swimming coach.' Plongée en apnée can mean free-diving or snorkelling. In practice what is forbidden at the swimming pool is sitting on the bottom of the pool holding you breath. The reason is that the lifeguard may not be able to distinguish that from someone who has drowned. Technically you are not supposed to swim lengths underwater unsupervised either, but in practice most swimming pool lifeguards tolerate that. 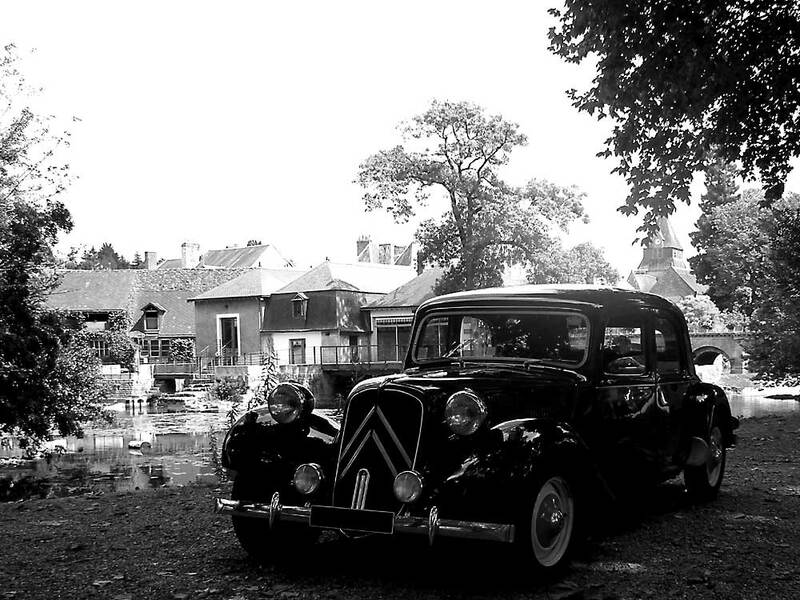 We went almost all the way from Preuilly sur Claise to Milan by train - the only exception being that we drove from home to Saint Pierre des Corps, parked the car in our garage, and caught the slow train to Paris there. 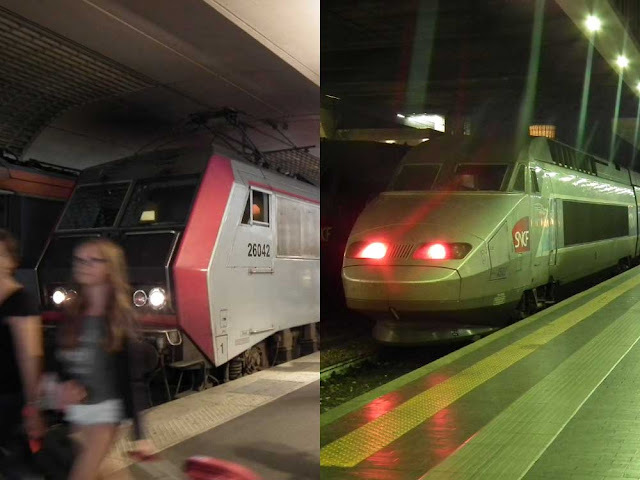 From Paris Austerlitz we walked to Gare de Lyon, a short 10 minute wander across a bridge built for that purpose, and caught the 14.41 TGV direct to Milan. Because we booked early we had afforded ourselves the luxury of first class tickets (cheaper than second class on the earlier train...), settled down in the relative cool and silence, and spot on time the train left. 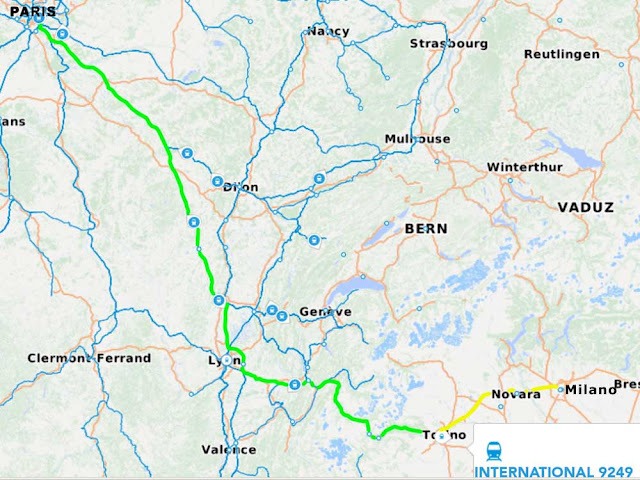 We travelled via Lyon St Exupery, Chambéry-Challes-Eaux, St-Jean-de-Maurienne, Modane, Bardonecchia-Stazione, Oulx, Torino Porta Susa, Rho-Fiera Milano, and arrived at Milano-Porta-Garibaldi exactly on time. Being first class tickets we had trolley service for drinks and snacks, and a couple of hours before arriving in Milan orders for our evening meal were taken at our seats and delivered there as well. The train is fast to Lyon St Exupéry, with a maximum speed of 300km/h, but once you get onto the windey rails up in the mountains everything slows down - sometimes as slow as 40km/h. At least it gives plenty of opportunity to look at Alps. 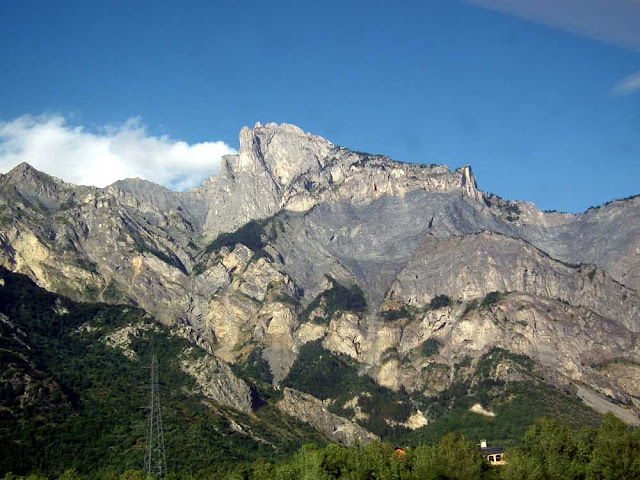 Once past Modane you travel under the Alps into Italy and more windey stuff before the ground levels out and the train gets up to 160km/h. The trip takes 7 hours (more or less). 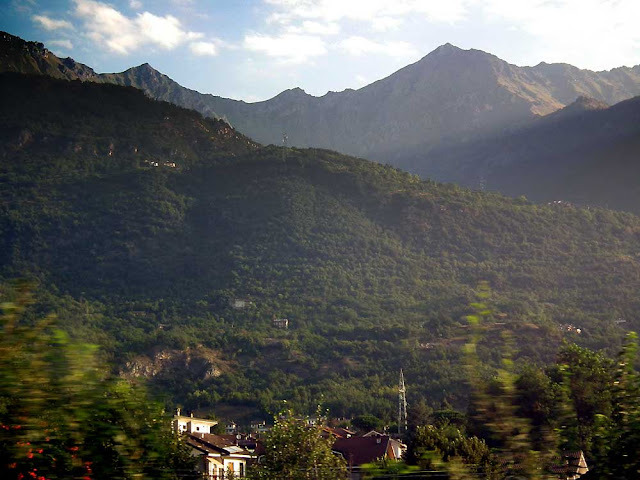 We love train travel, so much so that when we received an email saying that our return train was a bus replacement service from Milan to Modane we went to the SNCF Boutique in Milan and rebooked for an earlier train that wasn't affected. This cost us slightly more, but even though we had non-exchangeable tickets the penalty was waived by SNCF which kept the cost down. This is the second time we have been impressed by SNCF customer service in the past few weeks: other companies around here could learn from them. 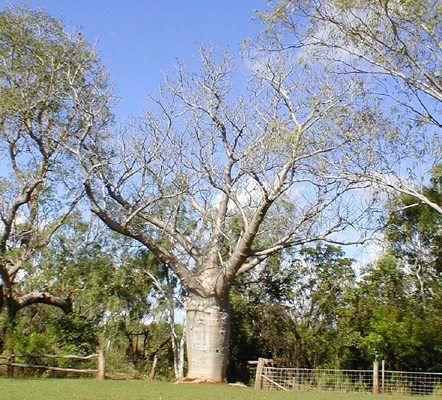 This Boab tree Adansonia gregorii was photographed near Springvale homestead in the Northern Territory. 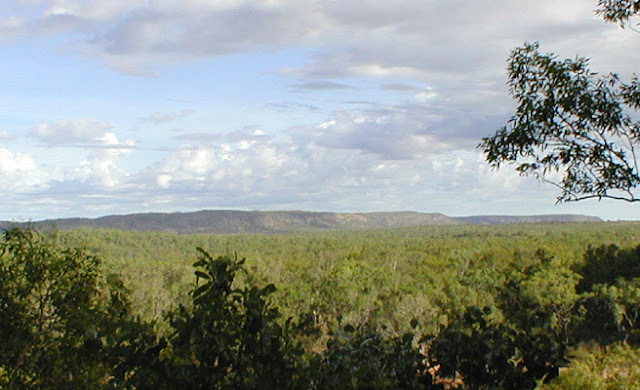 The species is endemic to the Kimberley region of Western Australia and reaching into the Northern Territory. The name Boab is probably a contraction of Baobab, the name by which the species Madagascan cousins are known. There are only 9 species in the Baobab family, most of which are native to Madagascar, a couple in Africa and the Arabian Peninsula and this one in Australia. The peculiar global distribution is thought to be because seeds from Madagascar floated across the Indian Ocean and established the colonies elsewhere. Over time these trees on separate continents have speciated. The generic name honors French botanist Michel Adanson, who described the species from Senegal. 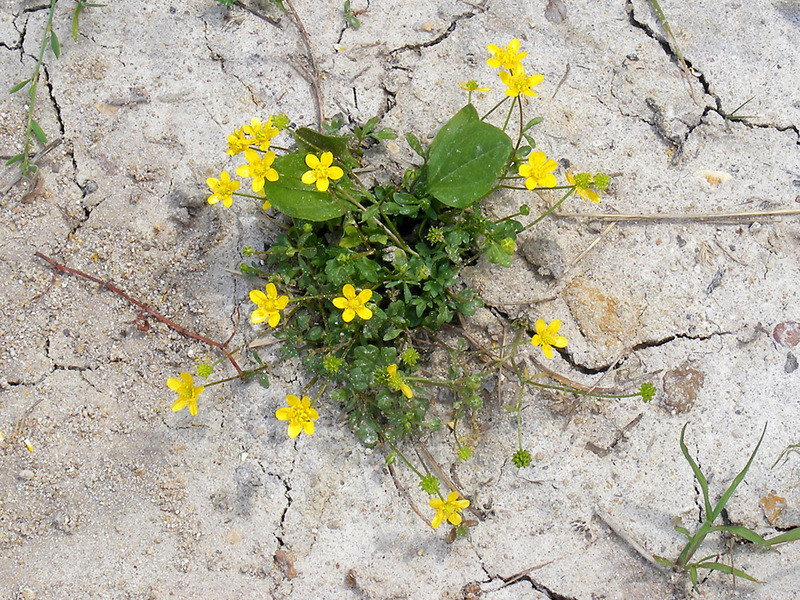 They grow in family groups from seed in the wild, but farmers often bulldozed them for agricultural land. Old and impressively bottle shaped ones have more chance of being saved as specimens even on agricultural land, where farmers will sometimes be willing to work around them. They grow very slowly, so the population is declining because the trees cannot reproduce and grow to maturity at a rate fast enough to cancel out those which are being bulldozed. The trees grow in seasonally arid areas and are deciduous, losing their leaves in the dry. The enlarged trunk is a water storage system and Aboriginals used them as a source of water in the desert. The flesh of the nuts was also eaten. We have just returned from a week with friends in Milan. We did heaps - far too much for one blog post - so we will be posting about specific places over the coming weeks (or months maybe). We went to and from Milan by train, an excellent (if slightly slow) way to go. It's great being able to wander around during the trip and carry bottles in your luggage if you wish, but train travel through the Alps isn't the fastest. Still, it's easier than driving, and both of us get to look at the view. Milan was...hot. No other word for it: 38 degrees every day, cooling(!) to 27 overnight. The thermometer in our apartment never showed less that 27.3 degrees the whole time we were there, which made sleeping difficult, but we did plenty during the days and usually managed to collapse in a heap at the end of the day. We saw plenty of churches (we went looking for old - and I mean seriously old - churches), museums and galleries, spent a day up at Lake Como, and ate plenty of gelati: three a day seemed to be an elegant sufficiency. There was also beer, pasta, pizza, and huge mountains of very fresh mozzarella, which is now one of our favorite cheeses. 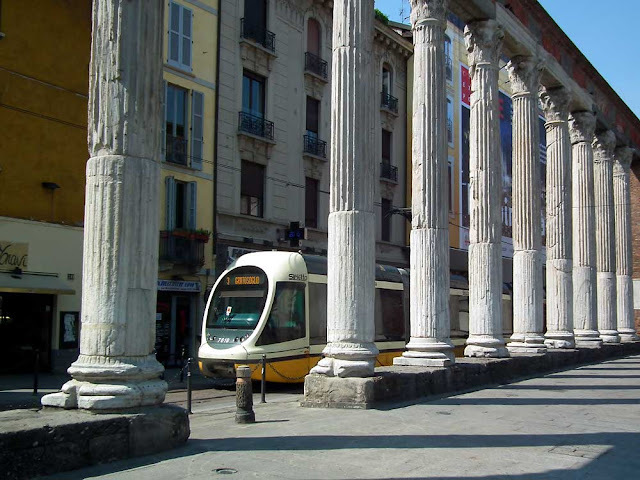 We got to grips with Milanese public transport, and really appreciated having two tramlines and a metro stop within cooee. We arrived home on Tuesday evening (to find the old fridge-freezer had defrosted) and have almost 1500 photos to sort through, collect our thoughts and try retrieve the memories that have almost melted together in the heat (did we mention it was hot?). 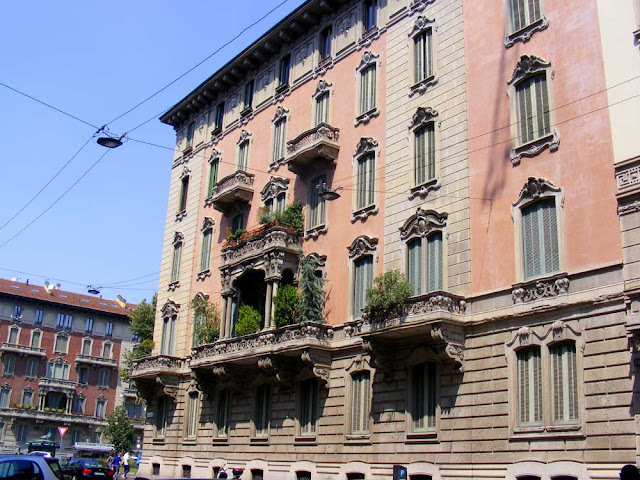 If you're going to Milan, look up our friend Stefania and her B＆B. She was fully booked for most of last week (which was why we rented an apartment) but her place has been really nicely done up this year, and she speaks Italian (natch), excellent French, and is an adopted Aussie and native Milanese.